William Moorcroft might be said to have been born in the right place at the right time, with the benefit of an incredible ability to master all the skills needed to ensure that his business prospered no matter what the economic climate of the times. He was born in Burslem in 1872 and educated at Longport Hall School prior to becoming a student at the Burslem School of Art. His considerable artistic talent led to a move to London where, in 1896, he studied at the National Art Training School, later renamed The Royal College of Art. Young William made good use of his time in the capital by deciding to make an extensive study of both ancient and relatively contemporary ceramics displayed in the British Museum and the South Kensington Museum. We recognise the latter today as the Victoria and Albert Museum. The following year he was awarded his Art Master’s certificate which would normally attract most students towards a career teaching art. However our Mr Moorcroft had set his sights on becoming a potter and, as the fates would have it, was offered the position of designer by the china and earthenware manufacturers James Macintyre and Company of the Washington works in Burslem. He wasn’t slow to see the god sent opportunity and showed no hesitation in eagerly accepted the vacant situation. The pottery made all manner of both relatively mundane utilitarian and decorative ware including artist’s palettes, door furniture and art pottery, alongside insulators and switchgear for the emerging electrics industry. In 1893 the company had enlisted the services of Harry Barnard, the well-respected designer and modeller formerly employed at Doulton’s Lambeth studio, in a bid to introduce art pottery into their repertoire. He was given the task of developing a range of ware that made use of a pate sur pate type of decoration that involved the building up of layers of slip in low relief. The method of decoration had already been well established and perfected at the nearby Stoke factory of Minton and Co. by the former Sevres decorator Louis Solon. 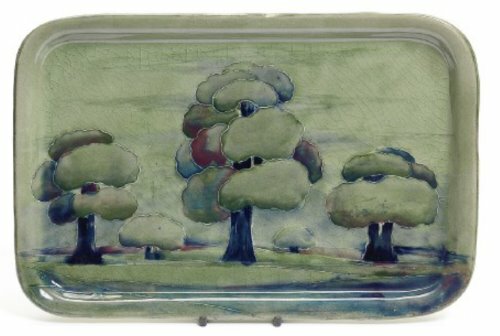 James Macintyre decided to name their new designs “Gesso Faience”, but regrettably for Barnard it failed to excite would-be buyers and he eventually moved down the hill to Josiah Wedgwood’s Etruria factory where he continued to develop slip decoration whilst his career underwent a renaissance. Moorcroft’s earliest designs were registered in 1898 and made use of under glaze cobalt blue complemented with iron red on glaze and gilt decoration that enhanced his new and inventive shapes, being retailed under the trade name of “Aurelian Ware”. William’s obvious childhood passion for nature and flora is evident in his treatment and choice of formalised repeated designs, which show a real synergy with the then all-important mentor of many a young art student–William Morris. Undeterred by the failure of “Gesso Ware” Moorcroft recognised the potential offered by slip-trailed decoration and set about producing Arts and Crafts’ inspired floral decoration married to imaginative organic forms. As a result his “Florian Ware”, launched in 1898, established William Moorcroft as the most exciting designer in British ceramics, able to produce in quantity contemporary designs that managed to embrace the traditional Arts and Crafts hand produced ethic. This ethic was promoted initially by Morris and later by the various Guilds that had sprung up in both Britain and the United States of America. As far as Messer’s Macintyre were concerned the most important outcome was that they had struck gold with young Moorcroft and found a highly distinctive art pottery that generated good income. William’s fertile imagination offered a regular flow of quite oftenbreathtaking designs over the next fifteen years that were not entirely limited to all things floral. In 1902 William had produced a design featuring Japanese ornamental Carp specifically for the London retailer, Osler. 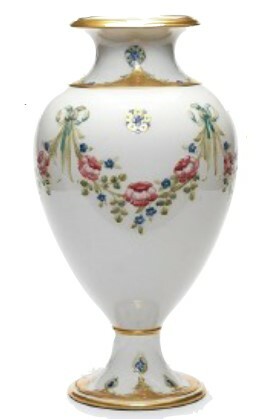 The firm soon became synonymous with a distinctive palette painted in tones of blue and mauve within slip trailed outlines; such vases carried a “Hesperian Ware” back stamp with other subject matter including Butterflies. That same year that saw the introduction of the first landscape design composed of a frieze of tall trees set amongst an undulating countryside and adapted to fit a variety of vases and dishes of differing size. Eventually labelled “Hazledene” the design proved especially popular through the premier retail outlet of Liberty and Co.
William’s friendship with Arthur Lasenby Liberty was eventually to prove of significant importance in 1913 when Macintyre and Co. decided to concentrate upon the lucrative electrical fittings market. With space at their Washington pottery at a premium they decided to close down their art pottery concern and part company with William Moorcroft. It is a matter of debate amongst present day Moorcroft authorities as to whether or not the two parties came to an amicable separation that saw William building his own ‘state of the art’ factory in nearby Sandbach Road, Cobridge, interestingly aided and abetted by the Liberty and Co. connection. New patterns were quickly introduced including utilitarian tableware using a porcellaneous body similar to that used by Macintyre in their electrical output and referred to initially as Blue Porcelain. The speckled blue tableware was a much-needed success that soon became synonymous with Liberty and Co.’s New Tudor Tearooms where it was known as “Moorcroft Blue”. The advent of the First World War led to an increase in export trade allied with government commissions to produce shaving mugs and hospital inhalers for the war effort, thereby allowing William to retain much of his workforce. However, it was in the post war years that he was able to consolidate his position and develop his reputation for producing richly coloured wares that continued to draw upon floral, fruit and landscape inspiration. Unquestionably the most successful design of the interwar years has to be his “Pomegranate” pattern, having been initially introduced in1910. The earliest examples display distinct buff reserves that by the 1920s had given way to deep cobalt blue, and the commercial success of the company was further enhanced in 1928 by acquiring the Royal warrant. Henceforth, until the death of Queen Mary in 1953, Moorcroft commanded the distinction of being “Potter to Her Majesty the Queen”. These inter-war years proved also to be a period of continuing innovation resulting in a relatively unsuccessful endeavour to produce metallic “Lustre” glazes on a commercial scale. Fortunately their “Flambé” pieces managed a more favourable response; when applied to standard designs the deep, almost blood red, glaze totally transforms the overall appearance and is much in demand by today’s collectors. The prevailing Art Deco style of the twenties and thirties appears to have been almost begrudgingly acknowledged in a series of often semi matt salt glazed designs that feature stylised waving corn, yachts, peacock feathers and even traditional landscapes above and below bands of blue and yellow chevrons. Such designs were in direct response to the change in fashion that not only favoured geometry and the abstract but now also preferred the pale and sombre tones, evident in the growing popularity of the creations of studio potters such as William Staite- Murray and Bernard Leach. It is worth remembering that it was studio pottery that presented Moorcroft with far more competition than the brightly coloured creations of Clarice Cliff or the stylish modern wares of Susie Cooper. Following William’s death in 1945, the destiny of the pottery was placed in the hands of his eldest son, Walter Moorcroft. Walter shared his father’s passion for flowers and proved himself to be a first class draughtsman by providing a skilful array of botanical designs over the remaining sixty years of his life. He died in September 2002. 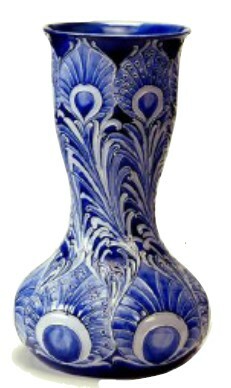 During the intervening years the financial stability of the company began to ebb and flow and ownership passed from family hands during the 1970s before being acquired in 1987 by Hugh Edwards, city lawyer and passionate Moorcroft collector and Richard Dennis, publisher and well respected dealer in art pottery. Against all odds they managed to restore the fortunes of the company by installing Richard’s talented wife Sally Tuffin as head designer before parting company with Hugh Edwards in 1993 to set up their now successful Dennis China Works. Moorcroft Pottery continues to prosper to this day with a young and immensely resourceful design team, headed by Rachel Bishop, and ably abetted by such design luminaries as Emma Bossons FRSA, Nicola Slaney and Kerry Goodwin. Additionally, it is able to call upon the creativity of Paul Hilditch, Vicki Lovatt, Alicia Aimison and Marie Penketheman. Over the next six issues of this illustrious online magazine I intend to offer an appraisal of each of their individual creative talents. The good news is that the pottery continues to carry the beacon of excellence whilst offering an ever-expanding repertoire of quality design. Yesterday, today and no doubt tomorrow the end result remains undeniably Moorcroft, ‘The Best of British’.